My favorite quote about fishing sums up nicely how we approach a day on the ice or open water. Anglers are usually an agreeable crowd, and I find them to be a “glass half-full” group mostly out of necessity. Not all fish bite, and especially mid-winter, you need to focus on the next one more than the last one. Still, the question remains, how to attract the next one and actually seal the deal? Your jigging stroke has the power to attract fish from distance and entrap them in a trance-like state, as they hang on your every movement until they have no choice but to commit. Your cadence, unfortunately, also has the tendency to draw them in close, only to get a strong snub upon a very close and tense inspection. You want to know the secret to unlocking the bite, the absolute undisclosed truth about what it takes to convert those “lookers” to “biters?” The secret is that I don’t know. Really, I can’t predict what it is that an individual fish will like, on a specific weather pattern, on lakes with differing structure, predator/prey relationships, and oxygenation. Not knowing, IS the secret, which means that each and every trip is a different occasion for hope and ultimately, testing. While I can’t offer a simple strategy for always knocking them dead, I can tell you my approach and process of elimination that has served me well throughout the years. I can also share some common issues with the way most people jig, hopefully helping you to eventually crack the code of the day, each and every time you hit the ice. For the sake of ease, I’ll generalize into two groups, perch/walleye, and panfish. I’ll also focus on what you should be seeing on your flasher to get the job done. The first thing to remember with ‘eyes especially is that they’re predators, so I start aggressive. “Take their temperature” by starting with larger, and quicker jigging motions. Most importantly, jig 2-5 feet off of bottom to give them room to appear under your bait. Jig too close to the floor, and bottom hugging fish can only approach from the sides, giving you precious little real-estate on your flasher to observe them. After the first few fish, you should have a good idea of how aggressive they are. Are they spooking when you drop the bait in their face, or do they chase it to bottom, hovering over it while it lays in the mud? Similarly, will they follow the bait upwards, several feet off the bottom where they originated? Aggressive approaches for fish that are willing will yield the most efficient results, but we know that mid-winter fish are famously stingy. This is where you really break down the bite. Sharp jigging motions now should only be used to draw fish underneath your bait and into the cone of your sonar. Once detected, every fish needs far more subtle motions. Focus on naturally wiggling the bait, first with small continuous spring-like jigging motions, as if you were drawing a small oval with your rod tip the size of a marble. Most fish are over-jigged at this stage, so that marble-sized stroke should be a good indicator if you’re waving the wand a bit too heavily. From there, experiment with changing a few variables. First, the size of your jigging stroke; go from drawing a marble, to maybe something the size of a golf-ball or bigger, then maybe back to something even smaller yet, that you can only achieve not by jigging, but by simply squeezing the cork on your rod handle. Next, experiment with working that entire motion upwards in the water column. Will the fish chase? Do they only react when the bait is moving, or do they like it when you occasionally “kill” the bait? Tough customers sometimes require the above and more, as you tease them off of bottom, watch them retreat, then approach all over again several times. This is where it’s best to keep doing what you’re doing on a per-fish basis. In other words, don’t experiment with too many different jigging strokes for a single fish. Instead, let the fish leave, re-set your approach, then feed a new fish a new look. Study an underwater camera and learn what small taps on a rod-blank with your fore-finger can mean for the bait and how it jumps. Recreate what is successful, reject what is not, treating each fish like the individual it is, while looking for clues and general patterns for all of the fish you work. Of course, a target-rich environment is best for learning, and experience is usually the best teacher, especially when fish are not abundant. Perch are aggressive school feeders that eat in a flurry. Commotion is what they thrive upon, often even when they’re in an incredibly neutral mood. Active schools move about constantly, requiring as much drilling as they do dropping of jigs, but keeping their attention is of paramount importance. This is often best-done with some friends, with one person continually jigging aggressively while marking fish, and another experimenting with different baits and jigging styles around the edges. Once the sonar marks dry up, it’s on the drill again to hunt them down. I break down the bite according to what they’re eating, free-ranging invertebrates about the water column, or bottom-focused meals that emerge from the substrate. Bloodworm or bottom hugging invertebrate bites are all about being near the lake-bottom, putting the bait in the mud as much as above it, and potentially even using underwater cameras for bite detection. I remember several extremely tough Devil’s Lake bites where fresh minnows and jigs layed on bottom were the only way to get bit. The struggling minnow was slurped up from bottom, but never while hanging anywhere in the water column. Jig-down into the mud, with a tight-line, stirring up mud and debris until you’ve created a visible cloud on your underwater camera. Study how fish react, learning how much to stir it up, and how much to wait it out. Other bites above bottom, like that of an underwater insect hatch from mayflies or caddis, will often see caught perch spitting up these invertebrates around the hole as you pull them out. These bites call for aggressive jigging upward in the water column, as you work fish higher and higher to get them revved up. Playing keep away here can be vitally important, as I believe the school gets more active with more fish feeding about different depth ranges. Fire them up, and only then focus on catching them. There’s no one-way to skin a walleye or a perch, but these starting points are a good way to launch the every-trip experiment, while honing observational skills on your way to cracking the day’s bite. The previous segment focused heavily on the thought that each fish has its own mood, persona, and likes/dis-likes. Bluegills especially take this idea to a new level, often being among the most challenging species to tackle during an off-bite. I’ve sat on schools of giant gills for upwards of 3-days, re-visiting them from time to time until weather stabilized and their outlook on eating improved. In high-front situations, with bluebird skies and spiked barometers, sometimes there’s very little you can do. While it happens, those lock-jaw moments are rare, and more often you’re left with a challenging, yet possible bite scenario tied to a specific color, jigging stroke, or low-light feeding window. Trophy mid-winter panfish are legendarily difficult to coax. Over the years of photo and film-shoots, we would focus efforts early and late specifically to avoid a closed-mouth session of bad-water bluegills. If you’re learning how to jig them into submission then, your best bet is to focus on the 3rd or 4th day of consistent weather, and a stable or falling barometer. Pair this with at least a half day on the ice to aid in your cumulative learning, either preceding or into and then out of a low-light period. Big gills hang in the water column nicely, as relatively stationary and solid targets on your flasher. Your first opportunity to impress is on the drop, so resist a hasty drop into a brand new school until you have your wits about you. Some baits simply drop better than others, so watch your bait for the first few feet to see what it looks like. Hopefully there’s no spin and the fall looks natural. Spinning reels and finicky gills have single-handedly brought upon the heavy selection of in-line or straight-line reels these days that allow line to evenly be placed on a spool without twist. Focus on slowly dropping your bait into a school of fish on a slack line. Are they rising to meet, or spooking in a refusal to eat? The next drop, try an artificial introduction to the fish on a tight line as you steadily control the bait’s fall until just above them. Sneak it in. Then start jigging. Again, focus on initial reactions from your flasher. Does an aggressive lift draw them closer, or does a more subtle jigging stroke tickle their fancy? 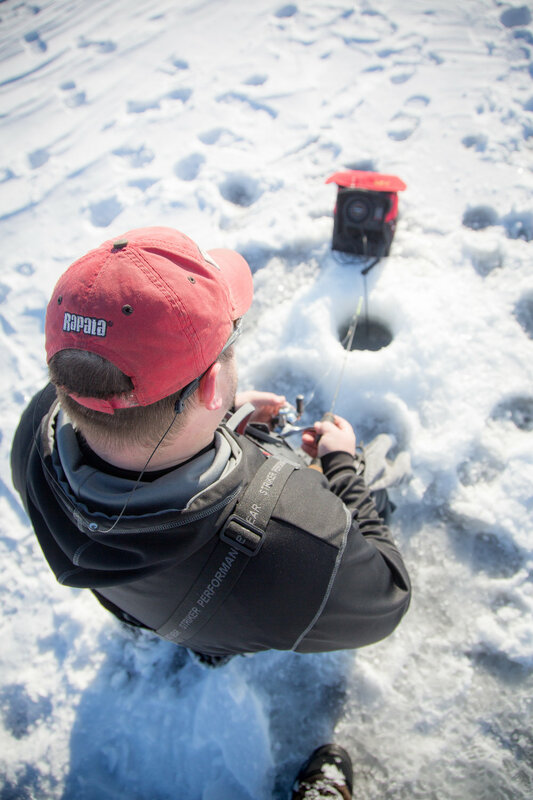 Technical gill bites are cause for a 2-step process that I like to call “lock-down” and “lift.” I palm the reel, placing the rig on my thigh or hip while kneeling on the ice. This settles and steadies my hand, allowing for some more fine motor-skill movements. From here, I tap the rod blank with a fore-finger to attract, then squeeze the rod-handle in quick-but-subtle bursts to get the fish to commit. As reluctant fish close, or as they retreat, I start a slow-but-steady lift to hit the re-set button. I will drop on a slack line or slow and tight line depending on what my early research has shown to be most effective, only to start the process all over again. Of course, each jig fishes differently based on design. These are general starting points from which to form your own opinions and best-practices, but keep them in mind next time you tackle a tough gill bite for which there seems no remedy. Crappies during much of the ice season are easy pickings by comparison, mostly because they suspend over deeper water, giving our sonar cones a chance to grow in diameter and scan a larger underwater area. Bigger crappies however are often found in weeds or roaming edges instead of basins, such that they’ll often jig up like a less-eager walleye. For finicky ‘pies, your challenge to jigging is often two-fold. Control of the jig is of great importance, but it’s made difficult by deep water and small sizes. On light bites, I’ll err towards the side of bite-detection with a stiffer-than-normal noodle style rod, and when fish are a bit more willing to chew I’ll use a stronger power and faster action rod than normal for better control. Crappies will often stratify according to size on your graph, with the better fish in the school either feeding high, or more often, sitting lower in the water column and protected by more enthusiastic biters above them. In such situations, fish fast with heavier tungsten or spoons to blow past the little-guys, but still stay above the better fish. Crappies seem more unwilling to follow a bait down, with bluegills, and then especially perch being more willing to chase down. For that reason, your crappie jigging cadence should be upward-centric. The up-down keep away game seems to work only with the very most aggressive crappies, and you’ll need to keep the bait quiet more often for really tough customers. The “lock-down” method works great as a fish really studies your bait, with crappies being notoriously light biters. What you may mis-interpret as a simple shake from your hand, may actually be a crappie sucking the bait in, before quickly pushing it back out. I like to focus on being still or at least very subtly controlled when jigging as a crappie approaches, knowing that my ability to detect his strike is as difficult often as simply getting him to commit. Whether crappies or gills, the right sequence and strategy can change throughout the day as fish’s activity levels grow and fade. Interpretation: What worked yesterday or even an hour ago may not be the order of the minute, so keep experimenting, and keep pushing as you learn while you lift your rod in observationally-patterned motions.